Copy or laser print your own all-weather forms, charts, maps, and worksheets on patented Rite in the Rain All-Weather Copier Paper. Now you can have the convenience of using your existing data sheets on a paper that can survive in any weather condition. For just pennies a sheet, Rite in the Rain enables you to work efficiently, regardless of the environment. Paper is 20# bond weight. Completely recyclable wood-based paper! Not for ink-jet printers. Copy or laser print both sides! 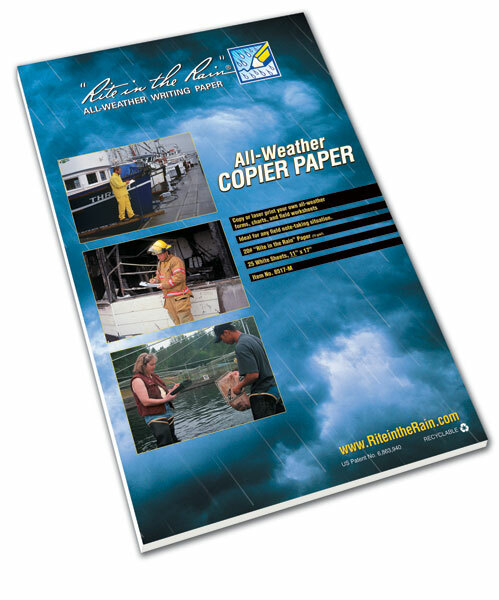 Copy or laser print your own all-weather forms, charts, maps, and worksheets on patented Rite in the Rain All-Weather Tactical Color Copier Paper. Don't flag your position with standard white paper. Protect your data and yourself with tinted Green or Tan Copier Paper. Tinted sheets also reduce glare in bright sunlight. Paper is 20# sub bond. Completely recyclable wood-based paper!